Ready to help increase the effectiveness of your organization and have fun doing it? 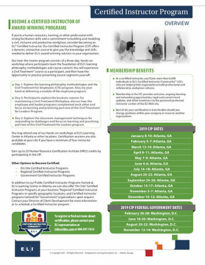 Attend an ELI® train-the-trainer program and become a Certified Instructor of Civil Treatment®. Our CT Basics Certified Instructor Program is an immersive three-days grounded in ELI’s learning philosophy, methodologies, and content delivery practice. You will attend an intense, hands-on workshop and learn the foundation of ELI course methodology and how to facilitate for maximum impact. Attendees present course segments, complete assessments covering key topics, and receive one-on-one feedback to help improve their effectiveness in the classroom. After successful completion of the CIP, client instructors are certified to teach any Civil Treatment® Basics course. Day 1 – The first day of the certification workshop is focused on introducing participants to ELI’s learning philosophy, methodologies, and the Civil Treatment® for Leaders (CT/L) program. Day 2 – The second day of the CT Basics certification experience is focused on participant practice of Civil Treatment for Leaders modules and receiving feedback. Participants in the ELI certification experience say this practice is invaluable to giving them a jump-start for success when facilitating the course for their own organizations. Day 3 – The Civil Treatment for Employees program is an important component of an organization’s strategy for minimizing risk. On day three participants explore how it compliments the leader program by facilitating one practice module. You may attend one of our hands-on workshops in Atlanta or other locations. Certification sessions are also available at your site if you have a minimum of four instructor candidates.